Joseph Bellows Gallery is pleased to announce its upcoming exhibition, Drawn to Light. This group exhibition will feature seascape photographs by Anthony Friedkin, Steve Kahn’s Corridor series, and architectural images by Grant Mudford. The exhibition will open on Saturday the 16th of May, with a reception for the artists from 6-8 pm. The exhibition will continue through the 3rd of July 2015. The title, Drawn to Light refers to photography’s intrinsic ability to render its subject by the agency of light, as well as each of the photographers: Friedkin, Kahn and Mudford’s acute sensibility to portray a specific quality of light that shapes the descriptive and emotional content of their photographs: breaking waves, foreboding corridors, and urban facades. Along with this connectivity, the three photographers represented in Drawn to Light, have lived and worked in Los Angeles during the same period, thus uniting each photographer’s work, and its relation to the history of photography in California. br/>Anthony Friedkin’s tonally rich black and white images of the Pacific Ocean depict the force and the quietude of its waveforms. Each wave is pictured isolated and unique, while suggesting the larger context of the surrounding ocean. 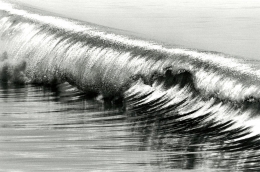 The resulting photographs reveal the momentum, formal beauty and reflective grace of the surf. As one looks at the photographs, it becomes clear that the artist is observing and understanding the waves as both photographer and surf rider. The images included in the exhibition are part of a larger project that spans several decades of recording the ocean and its culture. Steve Kahn’s The Corridors was the last segment of the artist’s series, The Hollywood Suites, which began in 1974. The images that comprise the Corridor pictures ￼explore the hallways that connect the private rooms of old apartment buildings in Los Angeles. Pictured under dim light, each corridor reveals a sense of luminance, whether natural or artificial, glowing within a veil of darkness, pulling the viewer toward one of the unknown rooms. Steve Kahn’s photographs are held within the collections of the Los Angeles County Museum of Art, San Francisco Museum of Modern Art, Museum of Fine Arts Houston, Bibliotheque Nationale, among others. He was the receipt of a Photographer Fellowship form the National Endowment of the Arts. Kahn’s Corrdors, will be the topic of a forthcoming one-picture book from Nazraeli Press, who in 2014 published Kahn’s monograph, The Hollywood Suites. Grant Mudford‘s large-scale, brilliantly luminous black and white prints exhibit a meticulous sharpness that depict both their subject and the light that shapes it form, with an astonishing exactitude and beauty. 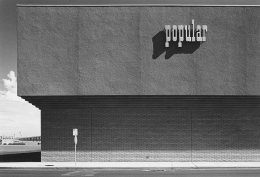 His work has been described by Keith Davis in, An American Century of Photography, as “An appreciation for both the alienations and incongruities of the urban landscape”. This investigation of the psychology of place is complimented by Mudford’s ardent observations on pictorial space and the inherent formal characteristics of his medium. His photographs have been exhibited internationally in both solo and group exhibitions since the mid 1970’s, beginning this exhibition history with a solo show at the notable Light Gallery. br/>Grant Mudford’s photographs are in the collections of the Los Angeles County Museum of Art, J. Paul Getty Museum, Museum of Modern Art, George Eastman House, Nelson-Atkins Museum, National Museum of American Art, among others. In 2014, Mudford was awarded the Julies Shulman Institute Award for Excellence in Photography. Other awards include a Photographer’s Fellowship form the National Endowment for the Arts.